Theater in the Now: Review: Sword Fights!!!!! Love the brutal fight scenes in the movies and wish they would come to life? If so, attend a performance of Coriolanus: From Man to Dragon presented by Shakespeare in the Square and Combative Theatre Co. Hope you don’t mind being part of the action, because as an audience member you are also a member of the company. This theater-in-the-round style show combines the words of Shakespeare with extensive fight choreography and audience participation. The show begins with the audience being led into a closed curtain with a single drummer at the front of the stage. This drummer is the beat throughout the show. 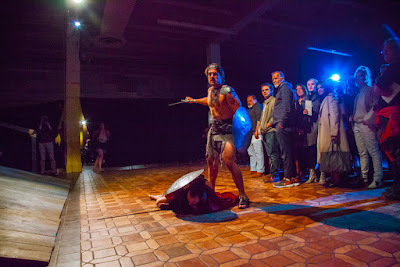 The audience is encouraged to stay on the outer rims of the space, but then when the show began everyone was ushered into the middle of the stage in a big circle by the actors dressed like warriors. The audience suddenly became the public activists that were unhappy with the government along with the warriors. But then, Coriolanus shows up to disperse the people and the audience were shuffled back to the safety of the outer rim. This went back and forth during the first act until seats appeared behind the black curtains. It was thrilling being part of the action the first time, but after that it made more sense for the audience to sit. Audience members were in the way of the actor’s entrances and exits which pulled one out of the show. Plus after it was done the first time the excitement and shock wore off. Shakespeare’s Coriolanus is not often done due to all of the difficulty and problematic story-telling. Omri Kadim did a nice job adapting this version and it was a smart choice to make the show about the violence. The show doesn’t have a lot of character development or change of tempo. The director, Yuriy Pavlish and fight director, Mitch Mccoy had their work cut out for them. The fight scenes are so extensive and complicated due to the style of fighting and the sheer number of actors involved. Safety is of the utmost important for both audience and actors. Each scene was a like a choreographed dance of violence, it was very compelling to watch. As an audience member, you felt the right amount of danger to keep you interested. The costumes were simple when the actors were townspeople, but the armor was so much fun! The shields, swords, hats, and buckled armor decoration was perfect to set the tone. With these costumes, by Fan Zhang, the audience was able to identify all of the characters portrayed since actors played multiple people at times! The fighting mostly happened in the first act, which left the second act to tie together the plot. Coriolanus is ousted from his community, but returns with vengeance by waging war against his own people. Eventually the audience learns that he is just a sniveling mama’s boy. The second act was definitely weaker than the first, but that has more to do with the original story than the production itself. Coriolanus: From Man to Dragon has such a commanding title, it left the audience wanting more from the Coriolanus character. The moment was missed when he chose to become this soulless blood seeker due to him being ousted. Not enough focus was put on that turn of events. In fact most major decisions were glossed over. The emphasis was on the physicality in the first act and it felt like the second act was less focused on. With that said, the company of actors did a fabulous job at playing their characters, wrangling the audience, and dealing with the incredible physicality this show demanded of them. The one choreography suggestion is to have the actors/fighters be more connected to their breath. Even in the fighting, moments were rushed. Pausing for a breath and dwelling in certain moments would help the audience develop an emotional connection while watching. Even if those pauses connected to the drumming happening that would also show the audience that relationship. He was underutilized. This is definitely an active Shakespeare play to see and Omri Kadim is brave to take it on. If one is not too familiar with Shakespeare this would be a great introduction! Some moments could have been given more weight, but overall the audience was entertained and this is all you can ask for sometimes.